WORDS OF LIFE (#2) – MERCY | Connecting with You! The Hebrew and Greek words of scripture are like inexhaustible mines and one finds new treasures each time the words are examined. This month, for number 2 in this series, I have selected ‘mercy’ and sought to open up this word up to reveal just some of the amazing truths and treasures it contains. In the Old Testament, especially in the KJV, the word ‘mercy’ is frequently used to translate the Hebrew word, chesed. We could define chesed as the sure and steadfast covenant love of God for his people (however this is a word that we shall explore more full in a later study). ‘Mercy,’ therefore is a most inadequate translation of chesed. However, there is another word which can be better translated ‘mercy’ – it’s the word racham. In English a variety of words are used to translate racham apart from mercy, for example … compassion, bowels and womb. All these seemingly different translations actually give us a deeper insight into the meaning of the word. The root of racham is ‘to fondle’ with the implication that there is profound affection behind the fondling. But as the meaning of the word developed, it began to reflect various significant emphases. The first time racham is used in the Bible, Genesis 20:18, it refers to a womb – ‘…the Lord had closed up every womb (racham) in Abimelech’s household because of Abraham’s wife Sarah’ (Genesis 20:18). Before abortion came to be thought of as a method of birth control, the safest place in the world was the womb. Apart from being a place of safety, it was a place also of nourishment and a place which held the promise of the future. When the elderly Jacob was blessing his sons before he died, he spoke to them about ‘…the Almighty, who blesses you with blessings of the heavens above, blessings of the deep that lies below, blessings of the breast and womb’ (racham – Exodus 29:26NIV). Racham is here related to blessings – those things that make life good and enjoyable. From racham comes all that is positive, good and productive. So mercy, like the womb releases life, potential, joy, blessings and hopes for the future. There is something dynamically life-giving in mercy (racham). The giving of mercy is the giving of a quality that is life-enriching. In its absence there is emptiness, longing, despair and hopelessness. The relationship between parent and child is unique. When our children are sick or in trouble, we feel deeply for them, we are extremely concerned and will do anything we can to put things right again. We love other children, but there is something that is inexplicably profound in our relationship with our own children. And when that relationship is broken, we long for it to be repaired. The motivating factor behind whatever we do to affect that repair is racham – mercy. Here the Father heart of God is so clearly revealed, and mercy (racham) is so evident. We see the same thing in the ‘Parable of the Prodigal Son’ (which would probably be better called the ‘Parable of the Merciful Father’) in Luke 15. Verse 20 states, ‘While he was still a long way off, his father saw him and was filled with compassion for him; he ran to his son, threw his arms around him and kissed him.’ It is clearly racham that is being expressed in the attitude and actions of the Father. Racham is that indescribably profound and lasting tenderness that parents, who are worthy of that title, feel for their children. It is undeniable compassion, but it is so much more. Integrally joined to it is profound concern for the well-being of the other, and, in the case of a fractured relationship, the desire for total reconciliation and total restoration. The reality is, however, that as much as a human parent may have mercy for his or her child, yet the mercy of God is inexpressibly greater. A mother may reject her child, but God never will his children. ‘Can a mother forget the baby at her breast and have no compassion (racham) on the child she has borne? Though she may forget, I will not forget you!’ (Isaiah 49:15). Psalm 18:1 says, ‘I love (racham) you, O Lord, my strength.’ Here racham is being used to express an intensity of feeling towards God. The measure of that feeling is probably best demonstrated by a quote from the KJV: ‘And Joseph made haste; for his bowels (racham) did yearn upon his brother’ (Gen 43:30). The emotion Jacob experienced for his brother was so strong that he felt it in the ‘pit of his stomach.’ In other words, he was feeling physically what he was experiencing emotionally. We might express it this way, ‘I love you Lord from the depth of my heart.’ The point is that racham, as it is used in Psalm 18:1 is expressing an intense of emotional response. Real ‘mercy’ is not just a casual or shallow feeling – it affects us very deeply indeed and is one of the most profound emotions we can have. The sense of goodwill that is expressed by the word racham is clearly seen in Genesis 43:14. The context of the passage is that Joseph had been cruelly sold by his brothers to merchants who took him to Egypt. In Egypt he prospered, became a kind of Prime Minister and, under his wise direction, Egypt made provision to store sufficient food for the coming famine. As the story continues, we see the amazing racham Joseph showed! Rather than exacting revenge on his brothers, his response to them was one of absolute goodwill undeserving though they were to receive it. In expressing similar sentiments, Paul writes, ‘But God demonstrates his own love for us in this: While we were still sinners, Christ died for us’ (Romans 5:8). That is the mercy dimension of God’s love. That is what mercy is – goodwill given to those who do not deserve it. The word racham is not to be equated with forgiveness, that is to say, it is not a synonym of ‘forgiveness.’ Nevertheless mercy has a flow-on effect. One may say that ‘mercy’ is the feeling and ‘forgiveness’ helps to give expression to it. In that sense we may say that there is a relationship between the two words. In Habakkuk 3:2 RSV – ‘O Lord, I have heard the report of thee, and thy work, O Lord, do I fear. In the midst of the years renew it; in the midst of the years make it known; in wrath remember mercy (racham)’ – Habakkuk is pleading for that mercy that releases forgiveness and deliverance. In the parallelism of Hebrew poetry, the last line of this verse takes the thought of mercy one step further into free pardon. Pardon, where needed, can be the natural outflow of mercy. This verse, rather than indicating the conditions in order to receive God’s mercy, is expressing the confidence that his mercy, accompanied by pardon, will surely be given. Paul writes to Titus, ‘He (Jesus) saved us, not because of righteous things we had done, but because of his mercy.’ (Titus 3:5). In the gospels we have so many examples of the mercy of Jesus being demonstrated in his dealings with people, and in his death on the cross the mercy of God is displayed in all its inexpressible wonder. This is racham! And that is why James declares, ‘Mercy triumphs over judgment!’ (James 2:13). Karl Bart has written, ‘The personal God has a heart.’ Yes! And that heart is revealed in racham! Dr Jim McClure, author of several books and Bible study series, welcomes questions from Christians seeking enlightenment on biblical perspectives. 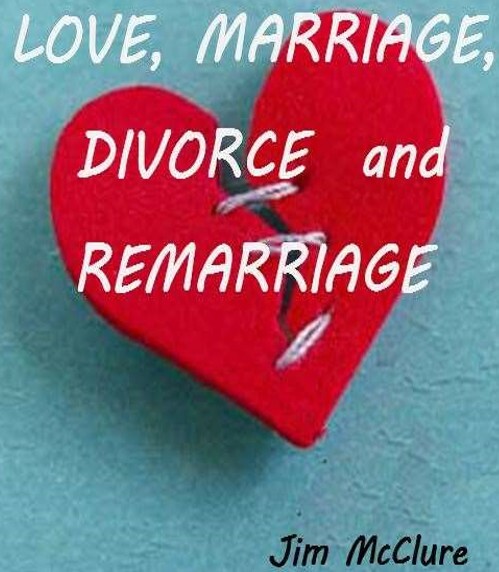 Love, Marriage, Divorce and Remarriage will soon be available in an electronic version in EPUB, Kindle and PDF formats with hyperlinks (as is Dr Jim’s well-researched Grace Revisited) and is offered free. Link for pre-booked orders: jbmcclure@gmail.com. ← DOES GOD STILL HEAL MIRACULOUSLY TODAY?